Marriage is a work in process. Even after being married for 17 years I'm still learning and growing. Yes, some things come easier but it is not easy. It is giving 100% of yourself to another person without expecting anything in return. Of course if your both doing that then your going to have a wonderful relationship. 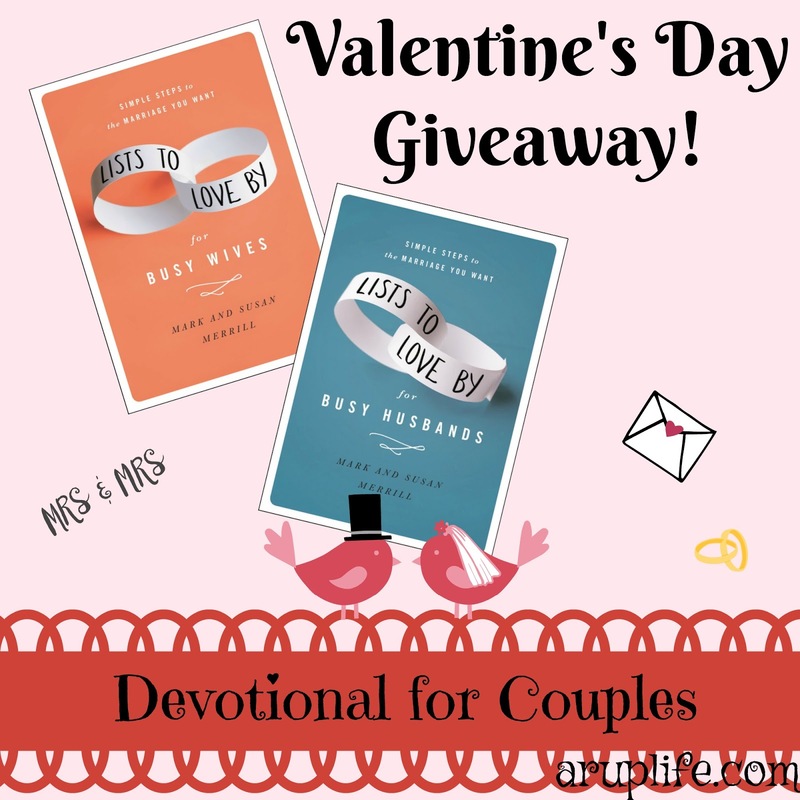 I've been reading Lists To Love By for Busy Wives as my February Devotional. This is an easy read that packs a heartfelt punch. There are many reminders for me - an old married lady- as well as some new ideas. I'm going to give my husband Lists To Love By for Busy Husbands as part of his Valentine's Day gift. I think this is a wonderful set to help us renew our hearts and love for each other this romantic season. From Mark and Susan Merrill, the founders of Family First, comes a collection of lists created for the busy wife who wishes to strengthen her marriage and love her husband well. It's no secret that there is a wide emotional gap between men and women. Couples crave love and attention from one another, but they don't always know how to show it. LISTS TO LOVE BY FOR BUSY WIVES presents creative and practical ways for wives to bridge this gap and improve their relationship. These thirty lists will carry wives through an entire month of learning to love their husbands more deeply with advice they will come back to again and again. From lists addressing a wide range of topics, readers will learn to set better expectations for their marriage, to communicate more effectively with their husband, to build a deeper foundation of love in their marriage, and much more. Husbands and wives bring different personalities, upbringings, experiences, and expectations into their marriage, which can lead to miscommunication and emotional turmoil. LISTS TO LOVE BY FOR BUSY HUSBANDS presents practical dos and don'ts along with step-by-step advice for husbands who want to bridge the emotional gap and improve their marriage. Mark and Susan Merrill understand that couples crave love, but don't always know how to express it to one another. These thirty lists will carry husbands through an entire month of learning to love their wives more deeply--wisdom they will come back to again and again. These real-life answers from a Christian perspective will help readers evaluate, refresh, and strengthen their own marriage. 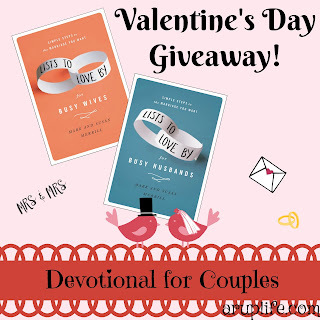 One lucky reader will win the Set of books! No, we've never completed one together. It would be a great idea though! We're going to be celebrating Valentine's Day this weekend. We'll probably go out to eat and see a movie! No Valentine's plans except to hang out with my kiddos! I have never completed a devotional with my spouse. I spent time with loved ones for Valentine's Day.